It is entirely possible to invade the privacy of your child, regardless of how close you are or how many other intimate things you share in other spaces. One day during a public speaking class, I had assigned group work and was walking up and down the aisles to help my students as needed. All of a sudden, like the wave at a basketball game, an entire row got out their phones and began shrieking over a picture on Instagram. To this day, I’m not sure what all the commotion was about. I just know there were gasps, outrage, and even some tears from the girl at the end of the row. This image has stayed with me, I think, because it captures an adolescence that would have been impossible for me to experience myself. I didn’t join Facebook until my final year of college and only vaguely knew what Twitter was. If I wanted to see what my friends were saying or doing online, I had to head back to my dorm and get on a computer. Navigating physical changes, hormonal outbursts, and identity development was hard enough as a teenager without the constant interruption of a pocket screen. Now with anxiety and depression on the rise among Generation Z, I wonder not if, but to what extent, growing up with social media is a factor. 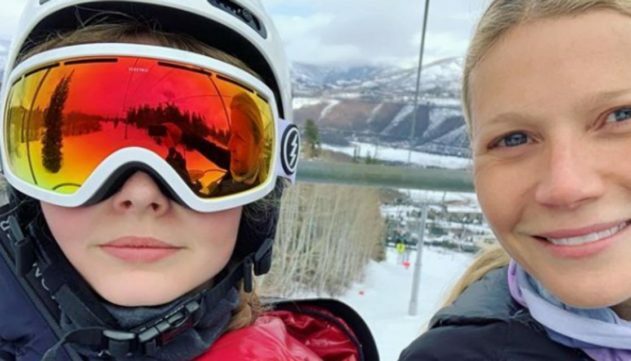 Paltrow shrugged off her daughter’s comment. “You can’t even see your face!” she responded, referring to the enormous goggles that hid everything above Martin’s nose. But as anyone whose parent has ever dragged out the dreaded naked baby pictures knows, there is such a thing as parental overreach. It is entirely possible to invade the privacy of your child, regardless of how close you are or how many other intimate things you share in other spaces. Others, like my friends Amanda and Bethany, have decided to be even more private when it comes to their young children’s online presence. Bethany does not share any photos of her son on social media and asks that others with photos of him do the same. In lieu of photographs, she periodically posts updates for her friends on how her son is doing, including some fun tidbits about his developing personality. Learning together, let’s hope, includes listening and respecting.